The (Foundation name), is a non-profit organization, created to raise funds to build a multi-purpose sport and activity center at Washington Public Schools. This facility will benefit every sport at Washington School, including activities such as marching band. In December of 2011, the community lost two avid Washington Warrior supporters; when cousins, Rocky and Scott Beller, lost their lives in a tragic plane crash. The (foundation) was established to continue their legacy, by providing a facility for the community, the school and the activities they held so dearly to their hearts. The Beller family legacy has been one of humility, support, honor and giving. Many would say the legacy began with Scott’s father and Rocky’s uncle, Calvin Beller. Calvin was responsible for helping bring little league football to Washington. He, along with others, created a tradition of respected sportsmanship to the area. Calvin loved the youth and he believed in his Warriors. For over twenty years, he coached many, including Scott and Rocky. He taught all players the love of the game and the character needed to excel on and off the field. In 2004, Calvin passed away from liver disease, but his legacy lived on through many, including Rocky and Scott. Rocky Beller was born and raised in the Goldsby/Washington area. He attended Washington Schools and participated in many activities, including football. Rocky was an avid Warrior fan. Not only was he passionate about supporting his children and their activities, he supported many relatives and members of the Washington community. Rocky coached little league and he wanted kids to find the love of God through the love of sports and he humbly gave of himself. 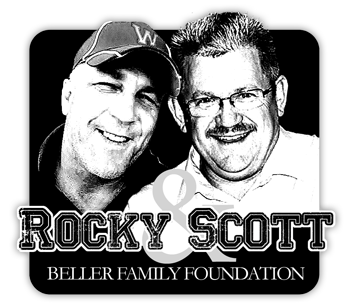 Rocky and Scott were so extremely proud when, in the fall of 2009, Rocky's eldest son, Brad Beller, became the head football coach of the Washington Warriors. They watched with such pride as Brad and the Warriors played on Friday nights. They were anticipating the future of the football program and enjoyed watching Brad's passion and knowledge of the game transpire through the young men on the team. Scott Beller was known as “the voice of the Washington Warriors”. For years, during various Washington sporting events, fans could tune into the local radio station and hear his enthusiasm and passion through his commentary. Scott also attended Washington Schools and played football. Later in his life, he coached little league football, softball and baseball for many years. He was so honored to be called a coach. Scott taught many kids, including his own children, the love and discipline of being an athlete. He lived by the motto, “work hard, play hard”. He unselfishly gave of himself because he, like Calvin and Rocky, loved the youth and loved the Warriors. All three of these men were the definition of a true Warrior. Now it is up to all of us to carry on their Legacy. By contributing to the Washington Multi-purpose Facility Project, your tax deductable donation will help provide a multi-purpose sports and activity complex that will serve many for generations to come. “Tradition never graduates” now, may the “legacy never die”. Thank you for your support.